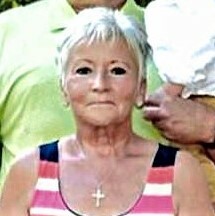 Kimberly Erwine Ankrum, 63 passed away Monday, January 14, 2019. She was born October 14, 1955 in Zanesville to Marvin and Patricia Humphrey Erwine. She married Dan Ankrum on June 1, 1974 and worked several jobs around Zanesville. She was best known for her work at Good Samaritan as a Ward Clerk. She was very knowledgeable to the medical field and most doctors told her she should have been a nurse. Kim joined the National Trail Volunteer Fire Department as one of the first lady fire personnel in the county and was also an EMT-A with the squad for many years. Later she became a sales person at LT’s Jewelry Center where she retired to be the best grandma you could ask for. She was also involved in getting the West Muskingum Athletic Boosters started and their bingo program. She served as a Past President of the board. Kim was a care giver and loved doing it. She had been caring for her mother until she passed and continued to care for her father until her passing. She leaves behind her husband, Dannil R. Ankrum; a son Brady Ankrum; a daughter Brooke (Brian) McPeck; three of the greatest gifts on earth, her grandsons: Caden, Drake and our little Easton; two brothers: Tim (Susan) Erwine and Jay (Candy) Erwine; and her loving father Marvin “Red” Erwine. She also leaves behind the very best friends, who are considered family: Henry and Sandy Luburgh & family; Chris and Terry King & family; Rose and Brent Johnson and the list could go on. She was preceded in death by her mother Patricia Ann Erwine. Calling hours will be 2 to 4 and 6 to 8PM, Thursday, January 17 at THE SNOUFFER FUNERAL HOME 1150 WEST MILITARY ROAD. Services will be held at 1PM, Friday, January 18 in the Snouffer Chapel. Burial will follow in Greenwood Cemetery beside her mother.